The Pullo Center will host The Price is Right Live!™ on May 28 at 7:30 p.m.
Tickets will go on sale Thursday, March 28 at 10:00 a.m. at The Pullo Center Box Office, by phone at 717-505-8900 or online. Members can order today. Playing to near sold out audiences for nearly nine years, The Price Is Right Live!™ has given away more than 10 million dollars in cash and prizes and sold more than 1.2 million tickets. 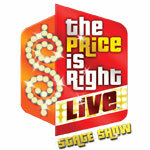 The Price Is Right is produced by FremantleMedia North America and licensed by FremantleMedia Enterprises. DATE/TIME: May 28 / 7:30 p.m.
TICKETS ON SALE: March 28 at 10:00 a.m.